Point Park University’s Kevin Taylor has been an influential member in bringing innovation to the school. As the director of athletic communications and assistant athletic director, Taylor has changed the way viewers can watch Point Park athletic events. When Point Park was a member of the Kentucky Intercollegiate Athletic Conference (KIAC), they had a basic streaming service for athletic events. Taylor wanted more, though. Taylor led the coalition to bring a more reliable sports streaming experience using Stretch Internet, that is now utilized by the entire River States Conference, the new name of the KIAC. Through this service, people all around the world can watch Point Park sporting events via high-quality stream. “They say those who can’t play, coach, and those who can’t coach write about it,” Taylor said while discussing his job requirements at the University. Although he has never played in the green and gold, Taylor has been just as involved as any coach or player at the University. “In my ninth year at Point Park I never lost or won a game,” Taylor said. 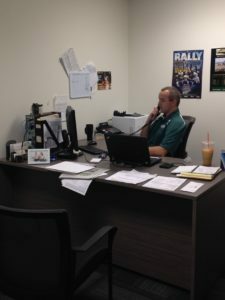 Taylor explained that his job requires him to cover the sports teams using social media, local media and Stretch Internet to provide the best coverage of Point Park athletics. “We inform the media, cover (Point Park) sports teams and publicize them to the outside world,” Taylor said. Taylor started his career at Indiana University of Pennsylvania (IUP), where he majored in sports management. After a work study job with the sports information department, Taylor knew he had found his calling. “At some point your career as a player will end,” Taylor, a former basketball and baseball player, said. After his undergraduate experience at IUP, he returned as a graduate assistant. Nine years ago, Taylor returned to Western Pennsylvania for his current position at Point Park. Swalga gave high praise for Taylor’s position at the University, which has grown tremendously over the past decade as more sports have been added at Point Park. According to Swalga, since 2006, the number of athletes at Point Park has grown from 109 to around 375. The number of sports at Point Park has grown from nine to 17, including the addition of men’s and women’s track and field. “When we add programs, we bring in kids who would not have been interested in Point Park,” Swalga said. Taylor’s passion about Point Park athletics is evident to Kelly Parsley, the University’s cross country and track and field coach. “His enthusiasm and passion have led to the success of our teams,” Parsley said. When Point Park joined the KIAC, now known as the Rivers State Conference, in 2012, Team1 Sports was the streaming service used by the entire conference. “We wanted to introduce video streaming and cost was an issue,” Taylor said. Team1 Sports was the most cost-efficient option because of the public service announcements it ran during streaming services. It was not entirely problem-free, so athletic directors within the conference began to talk about ways to improve their streaming services. As the official streaming service of the NAIA, Stretch Internet became one of the leading contenders to replace Team1. Although Stretch Internet had a higher cost than Team1, Taylor said reliability was more important for him. In collaboration with other universities in the conference, other athletic departments jumped on board and helped lower the cost for the service for the entire conference. “Streaming a single game will cost $7.95 for a viewer, or the viewer can buy an entire season of streaming for $24.99,” Taylor said. The streaming of Point Park sports greatly benefits teams that have international players whose families cannot make it to most of the sporting events. Men’s soccer has more than half of its members coming from other countries such as Saudi Arabia, England, Morocco and Brazil. Mass Communications major Mike Turk said he loves being able to do play-by-play broadcasting at the University’s sporting events to an outside audience, which could not be done without the guidance of Taylor. “He is a guy who knows his stuff and he passes it down to us broadcasters. He’s someone you can learn a lot from and he is very dedicated to his work,” Turk said. Depending on the sporting event, there can be anywhere between 30 to 100 people tuning in to an event. But, Taylor wants to take it a step further for the overall viewing experience. “I would like to get rid of the pay-per-view,” Taylor said. Pay-per-view is “paying for the viewing experience.” Currently, viewers have to pay to watch the Point Park Sports Network, which Taylor wants to eliminate the cost in the future. Taylor has already been able to get help from the new Center for Media Innovation (CMI), which has helped add a high-definition aspect. He has begun utilizing the CMI as an outlet to broadcast the UView shows in HD. Taylor’s hope is to extend this relationship to the games on the PPU Sports Network. “With the more coverage we get, the more real-life experience we get with it. Our equipment and broadcasters keep improving as time goes on,” Turk said. A lot of that improvement for the years to come will lie in the hands of Taylor, who is determined to be a part of the innovation.